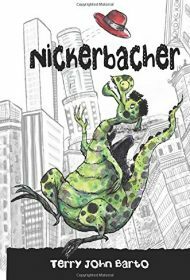 Expanding on Terry John Barto’s original picture book (Nickerbacher: The Funniest Dragon), this chapter book offers young readers a rich, imaginative tale about dreaming big, friendship, and overcoming oppression. Nickerbacher, as readers learned in the first book, is not a typical dragon. He isn’t satisfied with simply guarding a princess, even though he guards his friend and champion, Princess Gwendolyn. He longs to be a comedian, and news that the popular TV show, The Late Knight Show, is hosting open auditions is the chance he’s been waiting for. With the help of a bumbling but kind Prince Happenstance, the friends set off for La La Land to make Nickerbacher’s dream come true. Chapter books allow for more narrative detail than picture books, and Barto embraces the opportunity with the same vigor and humor Nickerbacher demonstrates at every turn. Readers are offered more tantalizing details about the magical inhabitants of La La Land (including a phoenix secretary and a leprechaun comedy coach), and spend more time with the dragon, his feisty princess, and their “Fancypants” prince. The lively black-and-white illustrations are the perfect companion to Barto’s smart, wacky humor. Nickerbacher will keep kids giggling while the message of determination, kindness, and acceptance settles in. Kids will not only learn the ingredients of good comedy (“Great comedy always has…truth and heart,” and “name calling isn’t very funny”), they’ll recognize the magic of friendship in the dragon’s relationships. Together, Nickerbacher’s friends not only help him resist the ongoing repression of dragon rights, they encourage him to stand up for himself and what he believes in. Barto’s chapter book is a rollicking celebration of hope that will excite readers with its rich, magical vocabulary, inventive storyline, and—of course—the laugh-out-loud antics of a silly, starry-eyed dragon.